Well, I don't know about the rest of you, but I live in the DC Metro area. Which means, right now, we're under a few feet of snow already, and more is coming. As in, it started snowing yesterday and won't stop until sometime tomorrow. We also got an inch of snow on Wednesday night- two nights before a possibly historic blizzard- that brought the DC Metro area to a grinding halt and caused traffic delays into the next day. Needless to say, after that and with the impending snow, we had Thursday and Friday off too. Snow days are really a mixed blessing- sure, the unexpected time off is nice....until you have to make it up in summer! So, with that, I decided to make a list of things that teachers do on snow days. 2. Relax with a nice cup of coffee or even a glass of wine. Relax? What is this, some parallel universe? Chances are you're spilling that cup of coffee all over the papers that you still need to grade because grades are still due tomorrow when everyone is back at school. Or maybe those lesson plans that you're trying to catch up on (again, being honest- what teacher ever manages to really "get ahead"? Hahaha) have a few tell-tale and hastily wiped away drops. Either way, there may be coffee (or wine) in your cup, but there's no relaxation going on in here! 3. Catch up on housekeeping. Are you kidding me? After shoveling all that snow? I've been up since 4:30 AM lesson planning, grading and shoveling snow. I hardly have energy to take off all my snow gear. Now you want me to clean the house? You're crazy. 4. Cook inspired and tasty dishes from pinterest. Yeah, right. Two after-school meetings and one after-school workshop this week, and I barely had time to make it to the store for milk and bread, much less full scale shopping. My fridge consists of 1 half-full box of wine, some ketchup, a shriveled head of lettuce, a few questionable pickles and leftovers from last weekend. What gourmet pintrest treat could I possibly make? We all know it's Count Chocula and wine for lunch- especially since all your frozen lunches are in the freezer at school. The family gets milk sandwiches for dinner. Ketchup optional. But first, you've got to read two chapters for the PD course you're taking to renew your certification, respond to the article your principal sent you on Raising Rigor in the Classroom, and prepare your discussion points on this week's chapter for the book study your grade-level PLC is doing. Then, *maybe* you'll have time to read something for fun....oh, who are we kidding? It's almost a relief when the snow day is over, isn't it? 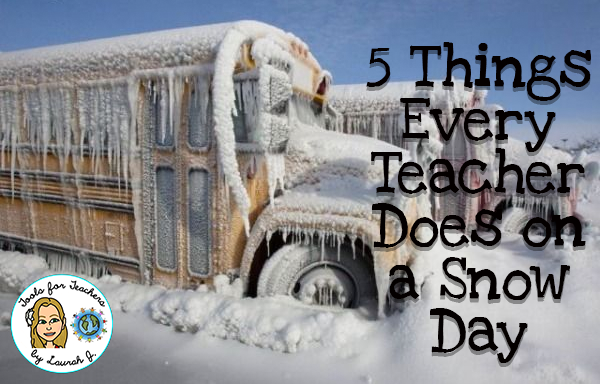 No matter how you've been spending your snow days, I hope you enjoy them! If you're wondering why teachers get snow days, check out this article.